the annealed eutectoid steel specimen are: cup-height, 30 mm maximum and ear, 6.4% maximum. where the trend is towards safety and fuel economy. ensuring accuracy of shape geometry . witnessing increased demand in the automotive industry. range of 710˚C - 790˚C. 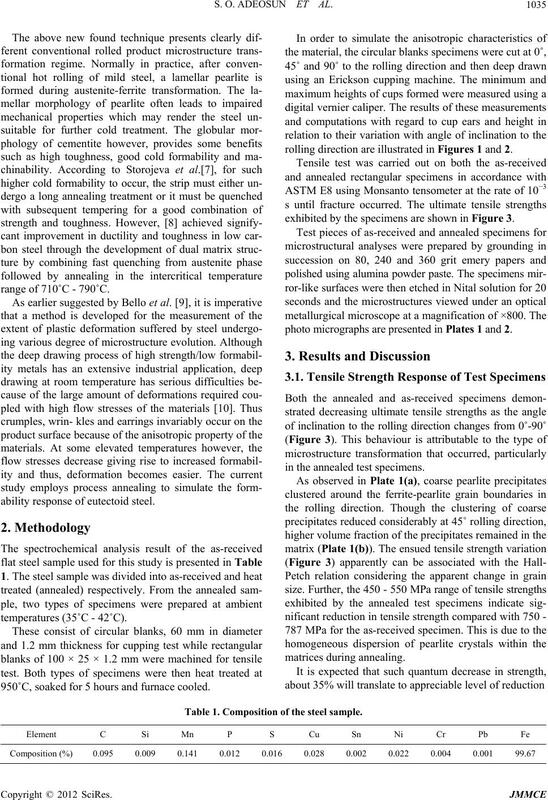 ability response of eutectoid steel. 950˚C, soaked for 5 hours and furnace cooled. rolling direction are illustrated in Figures 1 and 2.
exhibited by the specimens are shown in Figure 3.
photo micrographs are presented in Plates 1 and 2.
in the annealed test specimens. Table 1. Composition of the steel sample. S. O. ADEOSUN ET AL. Figure 1. Cup height against inclination to rolling direction. Figure 2. Earing against inclination to rolling direction. Figure 3. Ultimate Tensile Strength against Inclination to rolling direction. Plate 1. 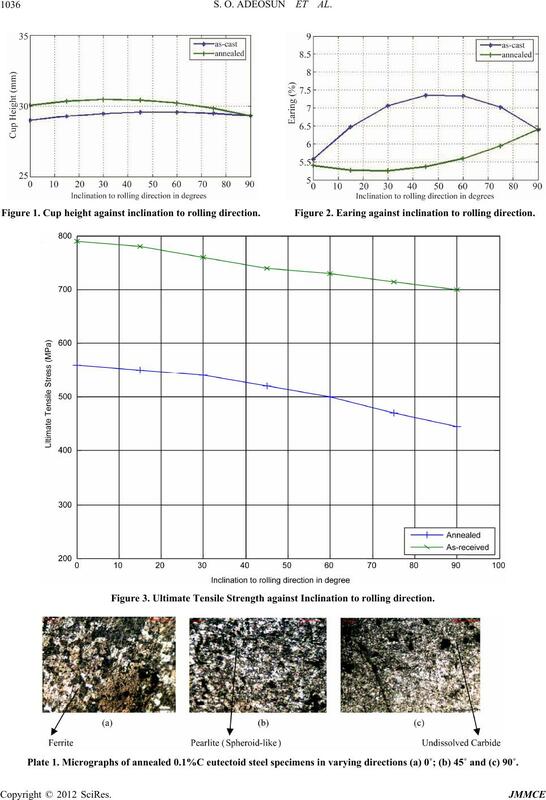 Micrographs of annealed 0.1%C eutectoid steel specimens in varying directions (a) 0˚; (b) 45˚ and (c) 90˚. Plate 2. Micrographs of as-received 0.1%C eutectoid steel specimens in varying directions (a) 0˚; (b) 45˚ and (c) 90˚. 2(b)) and 90˚ (Plate 2(c)) respectively. as-received respectively at 45˚ direction. and ear, 5.4% - 6.4%. 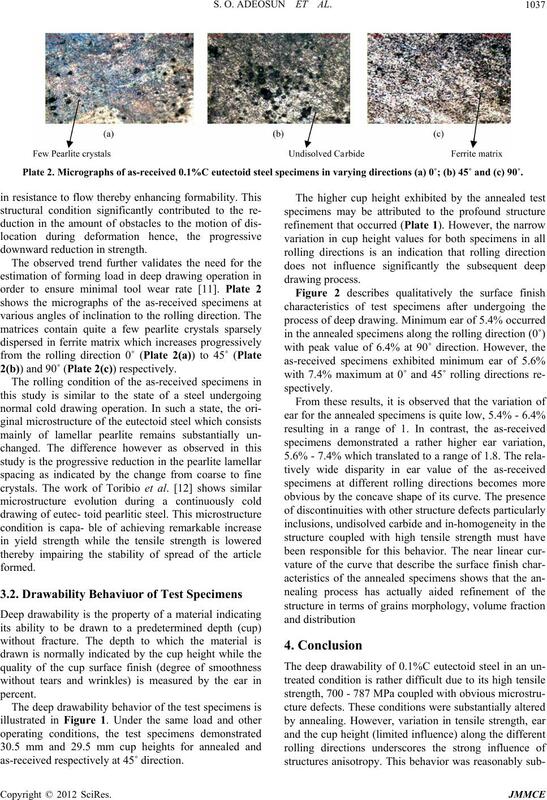 by Erdin et al. .
Vol. 334, No. 1-2, 2002, pp. 201-206. Engineering Publishers House, Minsk, 1994, pp. 45-76.
ence, Vol. 210, No. 1, 2005, pp. 45-55. 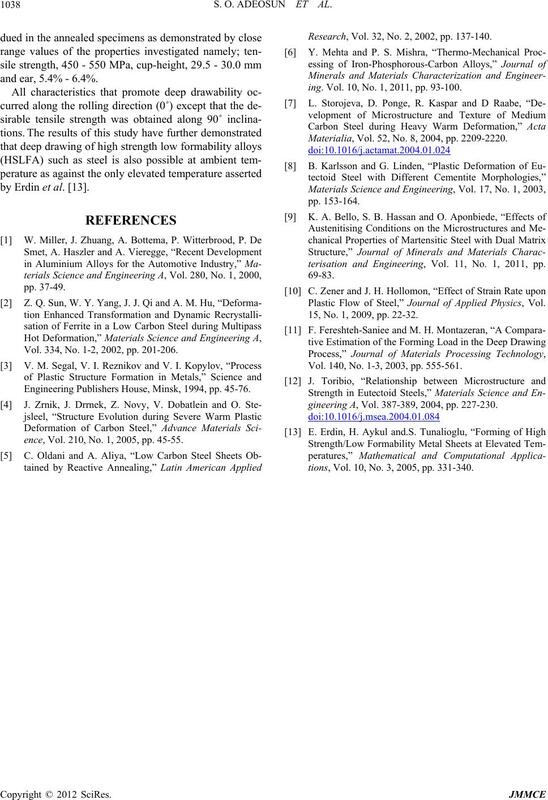 Research, Vol. 32, No. 2, 2002, pp. 137-140.
ing. Vol. 10, No. 1, 2011, pp. 93-100. Materialia, Vol. 52, No. 8, 2004, pp. 2209-2220.
terisation and Engineering, Vol. 11, No. 1, 2011, pp. 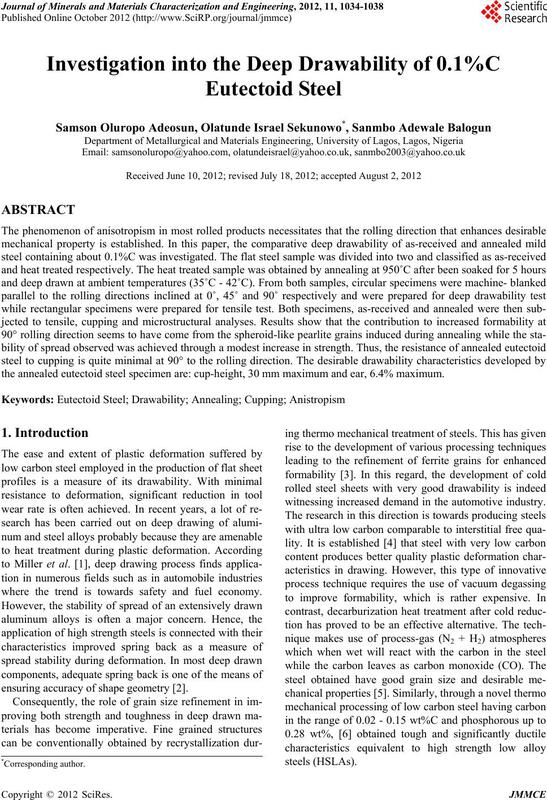 Plastic Flow of Steel,” Journal of Applied Physics, Vol. 15, No. 1, 2009, pp. 22-32. Vol. 140, No. 1-3, 2003, pp. 555-561.
gineering A, Vol. 387-389, 2004, pp. 227-230.
tions, Vol. 10, No. 3, 2005, pp. 331-340.